Crossovers and SUVs are all the rage—“all the rage” as in the lame way to say they’re what people call cool, and in that their astonishing sales numbers are causing a lot of rage among those of us who still appreciate small cars. But crossovers and SUVs are what sells, and the 2019 Acura RDX will be no different. The RDX is all-new now and comes with a ton of upgraded tech, from a 10-speed automatic to a totally revised touchpad infotainment system. While that stuff probably isn’t what most people surfing automotive blogs drool about all day, I’m a firm believer that almost everything can be fun to drive, especially in the right environment. It isn’t my dream Instagram car, but it was enjoyable to drive in the mountains, it handled roads well, and there are plenty of people out there who will jump right on it. The original RDX hit the market more than a decade ago, with paddle shifters and a turbocharger. The idea was to make a crossover feel more like a sport sedan, and the all-new-for-2019 third generation of the car is taking that idea to the next level. Like all new cars these days, it is 2.4 inches longer, one inch wider and has a 2.6 inch longer wheelbase than the car it replaces. The RDX isn’t as compact as it used to be. But it’s designed to edge out its competitors in a market segment that has too many vehicles to keep track of, with an extra cool factor and an aggressive price point. In other words, it’s exactly what dreams are made of for the crossover crowd. 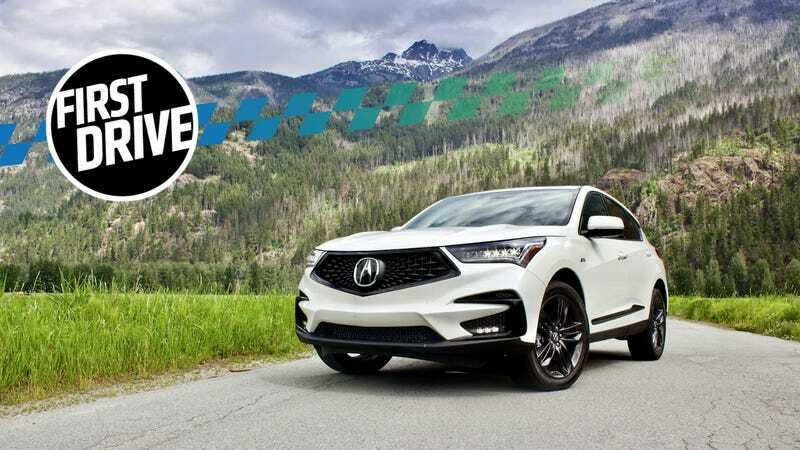 The 2019 RDX comes with a 2.0-liter turbocharged four-cylinder engine, with VTEC that’ll kick in and a 10-speed automatic transmission with paddle shifters. It’s rated at 272 horsepower and 280 lb-ft of torque, and, according to Acura, the RDX gets 22 mpg in the city, 28 mpg on the highway and 24 mpg combined. In the mountains for the short time we were in it, our car got about 14 mpg. That power number is down from the 2018 RDX’s 279 HP from its 3.5-liter V6, but just about everything else is an improvement—the 2018 car had a six-speed automatic transmission and 252 lb-ft of torque, and fuel-economy numbers are almost exactly the same between the new one and the old. The V6 is now gone entirely. The new RDX also has a 10.2-inch infotainment screen with a new touchpad system to operate it, Apple CarPlay, voice controls and a customizable heads-up display. An Android Auto system is on the way, Acura said. The RDX comes in four trims and the choice of front-wheel drive or all-wheel drive on all of them, with Acura’s AWD option adding $2,000 to the price of a car. The four trims range from the regular RDX to the Advanced package, with the A-Spec not falling directly into the hierarchy. There are also four driving modes: Comfort, Sport, Sport Plus and Snow. The lowest RDX trim starts at $37,300 for FWD, and Acura said the highest the car can go as far as MSRP pricing and options is $47,400 before fees. That’s a reasonable price point for a new compact SUV that looks as refined as this one does, and a starting price under $40,000 in such a popular segment of car sales—and for a car that can hold so much stuff—will at least get people’s attention. All of those prices also get $995 in destination fees slapped onto them. Acura’s A-Spec always falls out of the direct hierarchy, since it’s an appearance package and the features unique to it aren’t included in the trims above it. But, on the RDX, the A-Spec comes with different exterior and interior styling and colors, and falls between the Tech and Advanced trims as far as features go. Acura only had AWD models for us to try out at the launch, and all of them were either the A-Spec or the Advanced trim. The problem was, we didn’t get much time in the cars. I was in two cars, an Advanced and an A-Spec, over the course of 65 miles, and I only drove 29 of them. That’s not a lot. In our First Drive stories, we usually divide car features up by “what’s great” and “what’s weak.” But because I only got a few dozen miles total in the car—this was a “lifestyle” trip, not a traditional one for the auto press—so I’m not going to stick to concrete terms like “great” and “weak.” I wouldn’t want someone to judge me that harshly, that fast, and maybe that was the idea. Instead, we’ll do it like this. The styling of the new RDX is hard to miss. It’s a huge change from the second generation of the car, which was starting to look dated compared to all of the new models of crossovers coming onto the market. The 2017 Acura RDX (top), versus the 2019 RDX (bottom). Does the new one look better? Sure. They’ve finally moved away from that garish shield grille that everyone hated for years and years, and the new face is a big improvement. And like a ton of new cars in 2018, it has that piano black accent over the C-pillar for the A-Spec versions. It’s very shiny. The RDX was peppy for a crossover, and didn’t feel like it was begrudgingly lugging all of the vehicle’s contents around. That could have been because of the unnaturally loud fed-in engine noise, but we’ll get to that later. It also handled somewhat like an oversized sport sedan on the mountain roads, hugging fast corners and almost completely absorbing any disturbances to the suspension—potholes, bumps and the like. But while it was fun to drive on the winding roads, I, as a driver, was never able forget how large of a vehicle I was in and completely connect with the road I was driving on. The RDX also has a overhauled interior with speakers in the headliners, higher-end interior finishes and a new touchpad interface for the infotainment screen. There are 16 speakers in the highest trim of the RDX and four in the headliners, with one headliner speaker for each person riding up front and one on each side of the car in the back. The headliner speakers felt more like they were for bass than for overall sound, but, again, I didn’t have much driving time to play around with them. The Advanced trim’s interior felt significantly more posh than the A-Spec’s did, but that’s the idea—the A-Spec is the sport appearance package, and the quality of the RDX A-Spec interior felt miles better than the TLX A-Spec sedan’s did. Despite the two RDX trims having different appeals, sport versus luxury, the Advanced felt significantly higher quality. The wood accents that come on the Advanced trim, which are dull with wood grain instead of that glossy plastic style, also gave it a more expensive look. 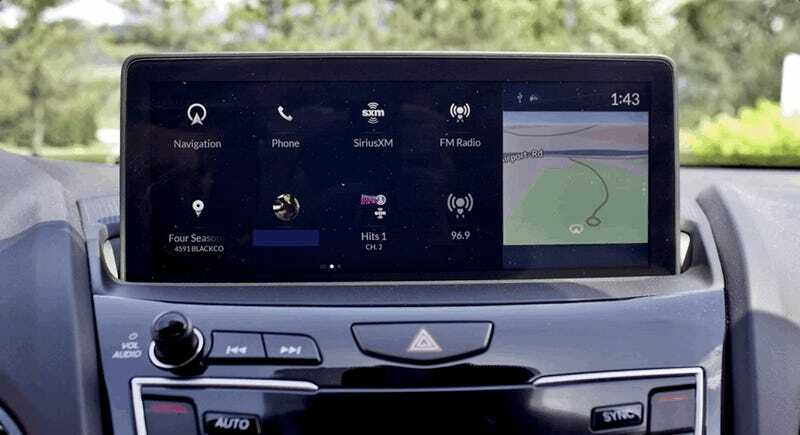 But the part of the RDX that Acura employees spent all week talking about was its new touchpad interface, which is an infotainment screen controlled by a touchpad near the center console instead of by touching the screen itself. Acura put the screen far ahead of the driver and passenger seats to put it more in the line of sight of the driver, but that also puts it out of reach as a touch screen. Bring in a small touchpad between the driver and passenger seats, which looks kind of like a mousepad on an older laptop. The touchpad is divided up into a large and a small section, and each of the sections control the screen up front by touch. The person using the touchpad puts their finger on it, moves it around to scroll over the menu option they want, then clicks the touchpad to select it. That all seems unnecessary when everything is a touch screen these days, but Acura says putting the screen out of reach helps keep a driver’s eyes up near the road rather than glancing down. Removing the touch screen also removes the need to clean nasty fingerprints all of the time, and the touchpad is easy to work with the proper tutorial—at a standstill, that is. Still, I don’t think it’s in line with how most people use their devices these days. But it felt like adding a touchpad added another thing for my brain to pay attention to: My mind was mainly on the road, then on the screen I was trying to use, then on my right hand, which was out of my field of vision, and how its movements corresponded with highlight on the screen. That was a lot of movement and information to juggle while driving. It became a smooth process as soon as the car rolled to a stop because my brain had one less thing to focus on, but it does feel like the kind of thing a buyer would get used to over time—especially when driving, um, more tamely. For a car enthusiast, it’s still hard to get behind the A-Spec package because it’s all show. It has bigger exhausts, loud fed-in engine noise, sportier styling and colors, but it’s all for show. It’s the same car underneath. The roaring fed-in engine noise in the RDX creates a frustrating mix of feelings, and that’s the case in more than just this vehicle. It’s almost impossible to deny that the noise makes a car feel instantly more aggressive and fun—no matter how much logic is telling you as the driver that it’s not real. It’s also sad to hear any car get its noise fuse pulled when that fed-in sound is so loud, like Engineering Explained’s Jason Fenske did with the 2014 Audi S4—showing just how quiet the cockpit gets without the roar of the enhanced noise. It’s frustrating, too, to think that someone will hop in an RDX and stomp the gas, hearing the roar of the gods and thinking their new crossover is making that roar all on its own. Imagine, then, that person going to their friends and showing them their tough new car. Repeat cycle. Feel your soul dissipate. For who I imagine as the typical buyer, though, that noise can be fun and cool. Same goes for the sporty accessories like the giant Hot Wheels exhaust tips. Other than that, the only thing that stuck out as a little odd was how separated the driver and passenger seating compartments are at the front of the vehicle. It felt like being in an actual bucket instead of a bucket seat, because Acura put a large, barred compartment in front of the RDX’s center console and under its infotainment screen. It wasn’t a bad feature of the RDX, just different—more compartmentalized than most passenger vehicles. I shall note again that I didn’t have much time in this car. But with how the U.S. market is for big, spacious rides, it barely takes stepping in the car to know how well it’ll do. No matter how much the crowd begging the car gods to save the manuals and produce more non-lifted wagons in the U.S., us, this new RDX is going to sell like Girl Scout cookies in front of the local grocery store—especially that A-Spec and its sporty facade. People want the room and ride height crossovers bring, and they want to look and feel cool while driving them. The exterior styling brings some attitude on any trim of the RDX, and the A-Spec’s extra design elements and manufactured sound create an aura of sportiness. It’s everything a crossover buyer could want at a decent price. I think a lot of buyers will find that hard to argue with.